Demonstrators outside 42nd Street Central Reference Library during the November 20th NYPL Trustees meeting- On right, Simon Verity-drawn banner: "Trustees- On Your Watch"
What do the New York Public Library Trustees know about what is going on their watch? Here’s a most basic question: Do they have any idea of the number of books they are making available to the public, and that the number of books in Manhattan’s most important libraries is significantly shrinking? The indications are they’re in the dark. I am reliably informed that the minutes for the last ten years of NYPL trustee meetings contain nothing about the number of books in the principal and most important libraries in Manhattan even as deals are being finagled to sell and precipitously shrink those libraries. Maybe I give the trustees too little credit. Oughtn’t they be able to infer that the number of books available in the libraries would significantly decline when library real estate is sold off and book shelves are kept half full? See: Thursday, November 21, 2013, Drastically Reducing Manhattan’s Main Library Space (At City Expense), The NYPL Was Only Just Recently Increasing Its Space (At City Expense), and Saturday, September 14, 2013, Empty Bookshelves As Library Officials Formulate A New Vision of Libraries: A Vision Where The Real Estate Will Be Sold Off. Or are they even paying attention to those things? Still, shouldn’t it really work in reverse? Shouldn’t those overseeing the administration of libraries start with a reckoning of how many books they have and want to make available to the public, with the real estate deals being worked out only afterward? 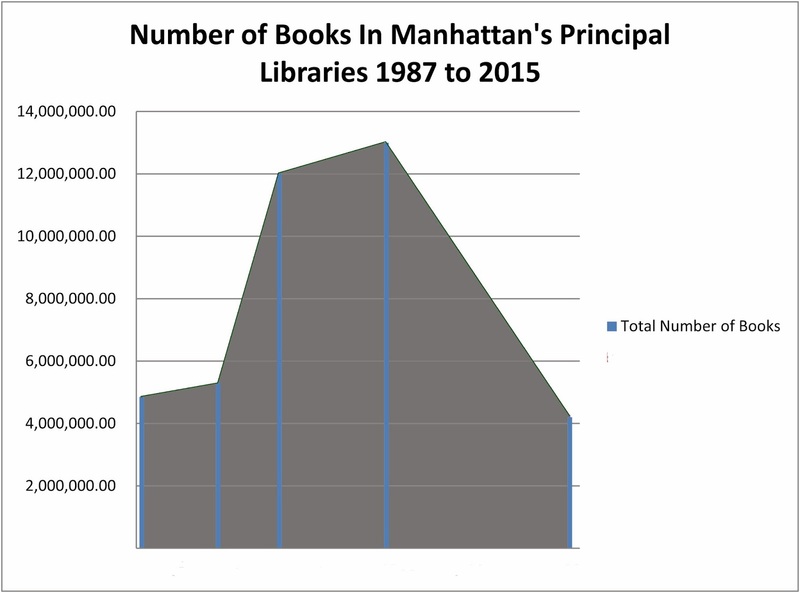 Exactly how many books have gone missing from Manhattan’s principal libraries without the library trustees paying the matter any note? A lot. . . . Well over half. . . . Perhaps two-thirds or more: What may have been thirteen million books or more in total, reduced to perhaps 4.2 million or less. But Donnell has now been sold to be replaced by something that will be relatively bookless and largely underground buried in the bottom of a fifty-story luxury hotel and residential building. Its collections were sent away (to be included now in these reckonings). Further, with the Central Library Plan (aka “the 42nd Street Library Renovation”), Mid-Manhattan and SIBL will be sold off entirely, and the research stacks of the 42nd Street Central Reference Library that famously holds most of its books will be largely demolished and decommissioned, no longer fulfilling the stacks original purpose. The NYPL’s 42nd Street Annex that held additional books nearby has also been sold off by the NYPL. How many books will the NYPL house when the Central Library plan is effectuated? The figure of 4.2 million could be a generous estimation, and that number can only be estimated as that high provided that all the book storage that was created to store books under Bryant Park is brought on line. Yes, that’s right, for those who did not know, there is book shelf space serving the 42nd Street Central Reference Library under Bryant Park. We closed Bryant Park for more than four years to create the under-park space. The park was reopened and some books were moved into it starting in 1992. The new shelf space was created to hold more than 3.2 million additional books (about 84 miles of books) where they could be more readily accessed by researchers using the Central Reference Library. Despite original plans, only the top floor of the new facility is presently in use, reportedly holding about 1.8 million books while the bottom floor could hold another 1.4 million. (See: Saturday, February 9, 2013, Libraries That Are Now Supposedly “Dilapidated” Were Just Renovated: And Are Developers’ Real Estate Deals More Important Than Bryant Park? and Library Starts Road to 84-Mile Shelves Under Park, by Susan Heller Anderson, October 27, 1987. The research stacks of the Central Reference Library around which that celebrated library was built (both conceptually and structurally) hold 3 million books, although the stacks were recently emptied as the NYPL readied them for the demolition to proceed with the Central Library Plan. In 1987, before the addition of the shelves under Bryant Park, the Central Reference Library held those three million books in the principal stacks plus, in other of its rooms, another 352,000 or more additional books, 88 miles of books in total. Most of those other books aren’t there now either. I recently spoke with a film location scout who had visited the Central Reference Library looking for a site to shoot a scene that would have a library room with books in the background. The NYPL couldn’t oblige him. He said that administrators explained that, aside from the Rose Reading Room (to which books from the stacks are brought to researchers), they recently had only two other rooms with books in them. So I guess if you want to remake Ghostbusters or a lot of other good movies from the past in that setting you will have to bring in either the CGI guys or an expensive load of props. It’s not just the ghosts you will have to be faking. 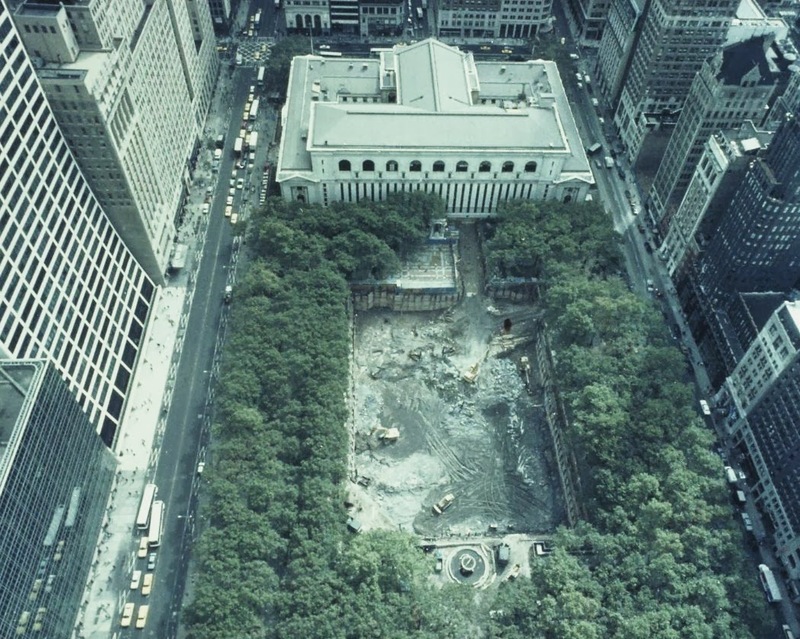 When the additional space was built for stacks under Bryant Park it was intended that the Central Reference Library would hold 6.2 million research books. In a pinch it would have been able to hold 6,552,000 books. But remember these figures are just for books in the Central Reference Library and don’t add in the books for the other nearby central Manhattan libraries. In 1996 when SIBL was opened there were reportedly 12 million books at the 42nd Street library locations (that’s exclusive of the Donnell books that were just a quick eleven-block walk uptown). 1.2 million books were moved from the Central Reference Library’s reference collection (about 32 miles of books) to SIBL and another 40,000 circulating books were moved there from Mid-Manhattan. Now the NYPL is selling SIBL (for which we paid $100 million) and has therefore been getting rid of most of those books. The Central Library Plan proposes that the 42nd Street Central Reference Library books would be reduced to what fits under Bryant Park, just 3.2 million books, fewer than were in the Central Reference Library when in the 1980s we made the sacrifice of closing Bryant Park to expand the library’s capacity. Further away, these books under Bryant Park would not be as quickly accessible for readers as research books in the originally designed stacks. How many more books and related items would there be in the library in addition to those reference books? Some at least because a circulating library to replace both Mid-Manhattan and SIBL would have to have books and materials. As I noted, 40,000 circulating books were moved from Mid-Manhattan to open SIBL in 1996. But as the shelves of both these libraries are now startlingly barren and the library seems intent on getting rid of books. I don’t know that it is fair to assume that the collection of circulating books in the space intended to replace those libraries would even be 80,000 books altogether. 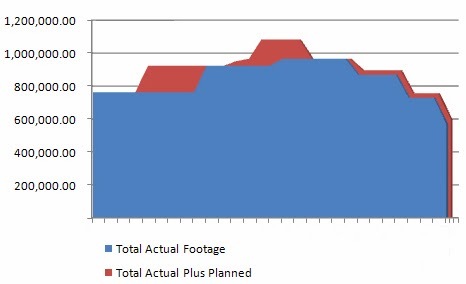 Nevertheless, I have generously estimated that the replacement circulating library might have as many as 100,000 books and have used that figure for the graph. If you prefer you can imagine a more precipitously falling line. Whatever number of books kept for circulation purposes they would all have to fit, together with reading and ambulation space for the patrons, into a much smaller amount of space than they came from that would be crammed into and replace what is currently the space of the research stacks. In the last released Central Library Plan design that meant fitting into 80,000 square feet created by demolishing the stacks. * The space, 80,000 or whatever, would have to accommodate what had been in the approximately 300,000 square feet of Mid-Manhattan and SIBL combined. The NYPL has issued public statements to the effect that a new design for the Central Library Plan will keep some of the research stacks, repurposing them for circulation use. Perhaps the new design will also slightly increase the overall square footage as well but it will no doubt be exceedingly challenging and, in the end, insufficient. Would you please address for me why the trustees are being asked to oversee major changes in the availability of library assets, together with significant accompanying physical changes to these libraries, without such information being a matter of review at these meetings? Or, if it is your understanding that these facts were subjects of the trustees’ review as the facts were changing over the years, can you please explain why such facts central to the status and administration of the libraries would not have been included in the minutes afterward? The response I got was that because Citizens Defending Libraries (a group of which I am a co-founder) is a plaintiff in lawsuit against the NYPL he could not, as the NYPL spokesperson, provide a response. The good news is that there is this lawsuit to which he referred and another that have thus far impeded the Central Library Plan’s planned demolition, thereby also its consolidating shrinkage banishing books. No matter that the lawsuit was given as a reason for the NYPL not to respond to my question, it is my understanding that the NYPL is not responding to other news media putting such questions to them irrespective of any lawsuits or the absence thereof. Not only should the NYPL trustees have been informed with specificity about the number of books that are being kept and the number of books that are being banished, the fact of the matter is that the public should be similarly informed. The public pays for the libraries and is being asked to foot the bill for the consolidating shrinkage of the Central Library Plan which, it turns out, can only be accomplished at huge cost. The idea that our New York City libraries needn’t have books is not isolated to Manhattan or the NYPL. It is being exported to Brooklyn, affecting libraries run by the Brooklyn Public Library. The other day a neighbor of ours stopped by the Brooklyn Heights Library with her daughter. The Brooklyn Heights Library is the biggest, most important library in Brooklyn, second only to the what is officially the main library at Grand Army Plaza. It is a main library comparable to Manhattan’s Donnell, Mid-Manhattan or SIBL and, because of its accessible location, the Brooklyn Heights library is perhaps even more important than the main library at Grand Army Plaza. Our neighbor and her daughter wanted to look at books about art history. They were stunned to find out the library had only one book available. The librarian there offered that if they knew what they wanted he could likely order up books that they specified and have them there in perhaps a day or so. That’s not what they wanted. They wanted to see books immediately. They had come to the library because what they wanted to do they needed to do that night. And they also wanted to browse. They didn’t know ahead of time exactly what they might want see. That’s why they wanted to look and to discover what interested them by looking at a lot of books and surveying the options. The NYPL is similarly inclined to think that having books elsewhere than at the libraries is satisfactory. The NYPL is participating on a coordinated basis with the Brooklyn Public Library (BPL) in the very same central processing and storage “Book-Ops” approach (handled out of Long Island City, Queens) that means that books won’t be readily found at the system branches and will have to be ordered. That’s the approach that resulted in there being no art history books to be found at the Brooklyn Heights Library. And the NYPL believes it is quite sufficient if Central Reference Library books (any that they haven’t, in fact, gotten rid of entirely) can, upon identification, be ordered and arrive in a number of days from Princeton in southern New Jersey. Trustee Luis A. Ubiñas left praised Trustee and Vice Chair Annette de la Renta right, for . . .? Respecting the trustees being in the dark about the rapid disappearance of books from the library, it may be worse than you think. Rather than the trustees receiving no information, no numerical figures about how many books are no longer in the library; they may actually be receiving and dealing in misinformation. 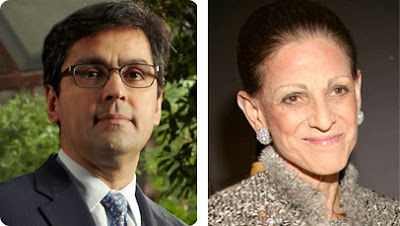 At the last NYPL trustees meeting, held November 20th, two trustees were being singled out for special recognition. One of them was Vice-Chairman Annette de la Renta (wife of Oscar de la Renta). Trustee Luis A. Ubiñas was one of those who took the lead in praising Ms. de la Renta. He did so in terms of praising what was happening in the NYPL system generally.
. . . those libraries have more books in them, in this era when books are evidently vanishing, than they have ever had before. Really? What universe is he talking about? Did he express this in terms of any figures he supplied? No. Did he, in fact, have any idea of what he was talking about? Did Ms. de la Renta as she was being so praised know whether there was any truth in what she was being praised for? Did she know relevant numbers? Did she know, for instance, if the number of books in the big central libraries in Manhattan was around 13 million in 2003? That it is now dramatically down from that number? That it was headed to maybe 4.2 million or perhaps less with the implementation of the Central Library Plan over which she was presiding? What do you think? It's rather awful if she didn't know. Still what is worse: Presiding over such a profound diminishment in the number of these libraries books not knowing these numbers. . . . or knowing the numbers? Perhaps the trustees take it upon themselves to read the institution's annual report, as opposed to rehashing information that is freely and publicly available during their meetings? NYPL boasts holdings of over 53 million materials. 'Dwindling' is a terribly leveraged term in this regard. Perhaps availability of physical books is being tempered in response to ebook circulation increasing 190% since FY'08? We insist upon forcing the good people of the NYPL to lobby for funding every year, instead of affording them a stable budget; has anyone calculated the cost of managing physical materials and compared it to the cost of managing digital materials? I'm not a librarian, but I'm quite sure decisions to 'dwindle' are based on usage statistics (as would be true in any profession where inventory management is a central focus). If materials are not being used, please cull them. I wouldn't appreciate my tax dollar being wasted on managing materials that are unused, or otherwise available in forms that are cheaper and/or easier to use. Really, most of the estimations, suppositions, and assumptions made in this piece could be largely assuaged by a single once-over of the annual report and a small dose of critical thinking. Noticing NY is one of my favorite online destinations to keep abreast of city happenings. However, the unceasing doomsday moans specific to NYPL is getting tired--as is the terrible reporting on the facts--and I feel compelled to look elsewhere for my local knowledge fix. p.s. The word [oughtn't] should never have made it through editing. Re the comment under the name Coral Delling- NYPL E-book circulation is only 7%. That would hardly seem to justify the emptying of the shelves that is going on unless it is intended to actually drive people into digital books (with temporary licenses that expire) in which case the circulation of ebooks would be even lower. There is also the matter (per Scientific American) of the brain being hardwired to prefer and learn better with physical books. Then there is the public's (including young people) preference for continuing to use physical books. As for the reference books, the license issues have not been resolved and they are largely NOT being digitized which (taxpayers) is expensive itself(see Charles Petersen's article). Also we can only hope that, following in the footsteps of the San Francisco library, we are not losing the books a they did theirs. The point about the annual report is interesting. Where exactly do you think the reduction of books from over 12 million to 4 million or fewer is highlighted for the trustees to see in which of the annual reports and where are you picking up evidence to suppose they looked at that and thought through what you are saying you think they did?